Italian yacht builder Benetti has launched the third hull in its FB800 series, the 49.8 metre Blake. Watch the video of fully custom yacht launching below. 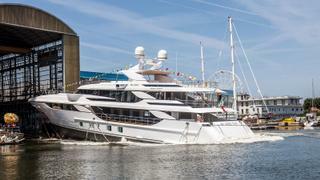 The new yacht made a splash, launching from the eight per cent-gradient slipway at the Viareggio yard. The builder invited more than 300 guests to witness the launch. Blake is the longest GRP hull and aluminium superstructure yacht ever launched by Benetti. She bears a strong resemblance to her sister ships Vica and Zazou. The exterior styling was created in-house, while London-based studio Bannenberg & Rowell was appointed to design the interiors. The décor has been described as modern classic with brushed fir, dark walnut and white oak woodwork as well as hammered bronze, light silver, etched glass mirrors and mother of pearl mosaics. Blake will include a huge owner’s apartment, measuring 60 metres square, complete with its own superyacht balcony. A further four double cabins on the lower deck and the option for two more guests to sleep in the convertible saloon area takes the total accommodation to 12 guests. Meanwhile, the crew quarters allows for a staff of up to nine. Other key features on board Blake include the dedicated superyacht beach club with its seaview terrace, which provides an ideal spot for enjoying the sunset, while the side-loading garage can house a tender measuring up to 6.3 metres. The yard adds that it has employed extreme vibration reduction measures to ensure Blake will deliver a smooth cruising experience. Naiad dynamic stabilisers will assist with this, and the whole package measures in at 498GT. Power will come from a pair of 1,600hp Caterpillar C32 ACERT engines for a top speed of 15.5 knots and a maximum cruising range of 4,000 nautical miles at 11 knots. Other superyacht projects currently under development at the Italian yard include the 63 metre Project Balance, which is also being built on speculation for a 2018 launch.